ISO (International Organization for Standardization) is an International, non-governmental and independent organization that develops international standards across industries. Today ISO has more than 22,547 international standards covering all areas of businesses. ISO standards provide world class specifications products and services to ensure they are of best quality and are trustworthy. These standards help consumers or customers to trust the reliability of products and services offered by a company. Ensure compatibility of products and services. Improve operational performance of systems and processes. Minimize risks and errors by following specific procedures. Customer satisfaction through reliability, quality and trust. Reduce wastage by following best practices. Identify & understand business opportunities and aid in their increase. Increases the effectiveness of core processes. ISO standards have been revised and we offer professional consulting to obtain the newly revised ISO 9001:2015, ISO 14001:2015 Certification & ISO 45001:2018. 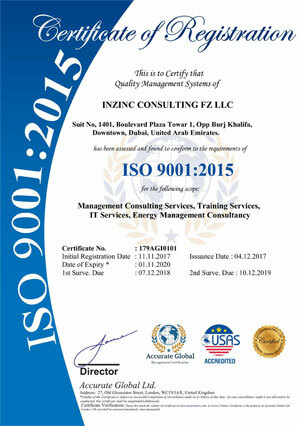 Inzinc Consulting offers world class consulting in ISO certification services across regions including UAE, Oman, Qatar, Bahrain, Kuwait, Saudi Arabia, Yemen, Georgia, Egypt, South Africa, Kenya and India. We provide ISO certificate for consulting, training, implementation and audit services in Abu Dhabi, Dubai, Sharjah, Ajman, Umm al-Quwain, Ras al-Khaimah and Fujairah. Inzinc is one of the fastest growing ISO Certification & consulting companies in GCC with experience across countries and continents including Africa, UK, USA, Canada, India, Indonesia, Maldives etc. We provide a comprehensive range of consulting, implementation and training services leading to certification of various ISO standards for organizations across the world. Our ISO certification solutions are considered to be the best in terms of service delivery, certification approach, timely project completion and effectiveness. Our ISO certification services expertise lies in various standard such as ISO 9001, ISO 14001, OHSAS 18001/ISO 45001, ISO 27000, ISO 27001, ISO 26000, ISO 17025, ISO 13485, ISO 12100, ISO 10002, ISO 10006, ISO 50001, ISO 80079, ISO 3834, ISO 9004, SA 8000, HACCP ISO 22000, 2012/83/EC, GMP, EN 15221, CE Marking and many more. We provide a comprehensive suite of consulting, training and implementation services leading to certification to various ISO standards for organizations. Inzinc Consulting a full range of consulting services that enable the organizations achieve sustainable competitive advantage in uae and worldwide markets. Inzinc Consulting offer wide range of energy consulting for improvement of the Energy management system, green building and other renewable. BI comprise of strategies that help organizations gather data and convert them into meaningful information so companies can take the right. @ 2018, Inzinc. All rights reserved.